Build your platform. Engage your fans. Sell more books. Understanding the need and the benefits of developing a targeted and responsive email list is important, but taking the steps to actually implement what you’ve learned, is essential. And this is where most people get tripped up. Because between theory and application, there is often a chasm of indecision, fear and even plain old procrastination. So to eliminate this gap, this post will hammer out the exact steps you need to take to set up your email list and start collecting email addresses on your website. You’ll not only know how to create–and where to place–your web forms, but have a collection of tools that will help make the task much easier. So please don’t just read this post. Take action! This is your “no-fluff” cheat sheet for getting your email list set up TODAY. There can be a lot of moving parts to creating your first email list, so it’s important to get a clear understanding of both the behind-the-scenes process, as well as the experience from your new subscriber’s perspective. As you can see, there are several things happening at once, so as we go through each step, reference the Email List Building Diagram so you can stay oriented. There are several options available when it comes to email marketing services, but Aweber is the service that I use and recommend. It’s easy to use, the customer support is super helpful if you get stuck or need a little extra help, and if you have more than one email list (author website list, book website list(s), etc. ), you can manage them all with just one account. Sign up is simple. Just go to Aweber and you can get started for just $1. An important tip: remember that this is your business. No matter how friendly or casual your interactions with your fans, you still need to be professional. Never sign people up without their permission, and always require a double opt-in from your subscribers (which requires sign up AND confirmation). It’s your job to ensure that your subscribers are interested, human and legally obtained (see U.S. CAN-SPAM Act or Canada’s Anti-Spam Legislation (CASL)). An email service like Aweber, makes it much easier to ensure your emails are CAN-SPAM or CASL compliant. Tip: Consider getting a UPS or PO Box to use as a business address instead of using your home address in the “Contact address” field. Remember to save your settings and proceed to the next page. You will then be asked to add your “company brand” info (in most cases, this will be your name), as well as set your social media integration, if you choose. An opt-in confirmation email is the second part of the “double opt-in” process noted briefly above. This is an email that is sent immediately to your new subscriber after they have signed up (or opted-in) to your email list via a form on your site. It requires the new subscriber to re-confirm their intent to receive emails from you, by requiring them to click on a confirmation link. (It also ensures the validity of the email they’ve provided). The email is pre-written, but you can customize and tweak it to better fit with your personality and brand if you wish–just keep it short and simple. Leave section two “Require Opt-In on Web Forms” set to ON. Then move on to the next section at the bottom to add your “Success Page”. 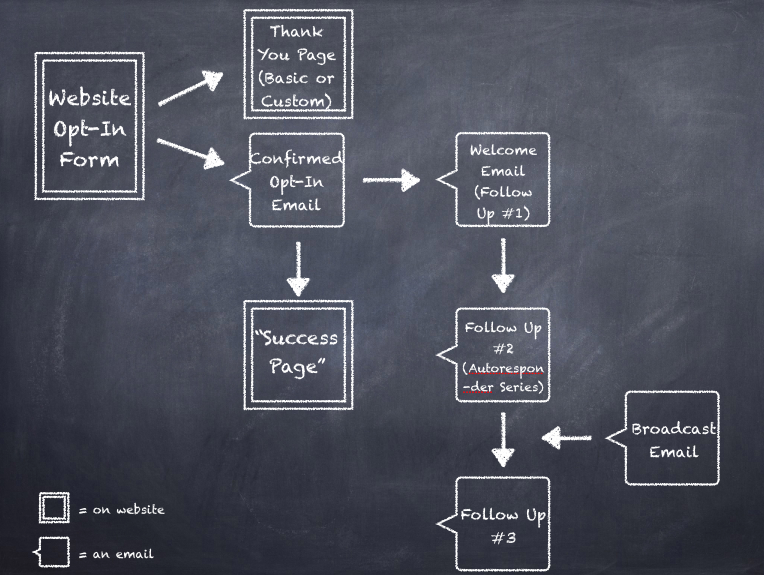 As noted in the Email List Building Diagram above, your new subscriber will be directed to your “Success Page” once they’ve clicked on the link in the confirmation email. A welcome and a thank you for joining your community. Let them know that they will soon be receiving an email from you (Follow Up Email #1 in the diagram), which will include a link to the opt-in freebie you promised or more information about what to expect. Direct them to recent or important posts, events or a New Here? page that helps them get up to speed. Additional ways to contact you, as well as a reminder to add you to their safe senders list. Once this page is complete, copy and paste the URL into section three, under where it says “Confirmation Success Page URL”. Save settings, and move on to Step 5. Now that we have the basics in place, it’s time to create the forms that you can add to your blog or website that will collect the email addresses from eager readers ready to sign up! The first step before designing your forms is to determine where you will place them, and what information you wish to collect (apart from an email address). You can add additional fields to your form, like name, phone number, etc., but keep in mind that every additional bit of info that you require from your subscriber will increase their resistance to subscribing. My suggestion is to keep it as simple and easy as possible by asking only for a name and email address (or even just an email address). It’s a prominent and prime location. It’s usually shown on every page. Blog readers have come to expect to find a form there. But there are many other locations in addition to your sidebar where you can add forms to capture your readers’ email addresses when they are most inclined to give it. Readers are most likely to share their email info when they are engaged in your content. Therefore it’s important to look for other opportunities and locations on your site to place forms that encourage sign ups–but without being repetitive, annoying or overly intrusive. At the bottom of posts. On a Free Updates page. At the top of your site using a feature box or the hello bar. Not sure what a feature box is? Check out this post on the feature box method to list building by Derek Halpern at Social Triggers. For a simple tool to help you design and add a feature box to your WordPress site, try the Optin Feature Box Plugin by Plugmatter. Popups. This one is a bit controversial, but I’ve found a great free “exit intent” plugin – PopupAlly – that you can set to prompt your readers to sign up just before they are about to leave your site. On your Facebook Page. Here’s a video tutorial via Aweber on how to add a form to your Facebook Page. Now that you have some ideas as to where to place your forms, you’ll have a better sense of how to design the forms to fit these locations. Aweber has oodles of opt-in form templates to choose from, or you can choose to design your own to coordinate with your brand colours and style. This will bring you to the web form editor which will allow you to select a form template, edit the template, or create your own custom form. Advanced Tip: Adding an image or graphic to your form can give it a little extra pizazz. You can coordinate the form to your website and author brand, or add a fantastic cover image of your stellar sign-up incentive. Determine your sidebar dimensions (or the dimensions for the form you wish to create). Use a photo editor like PicMonkey to create a background graphic or edit/resize an image you wish to use. 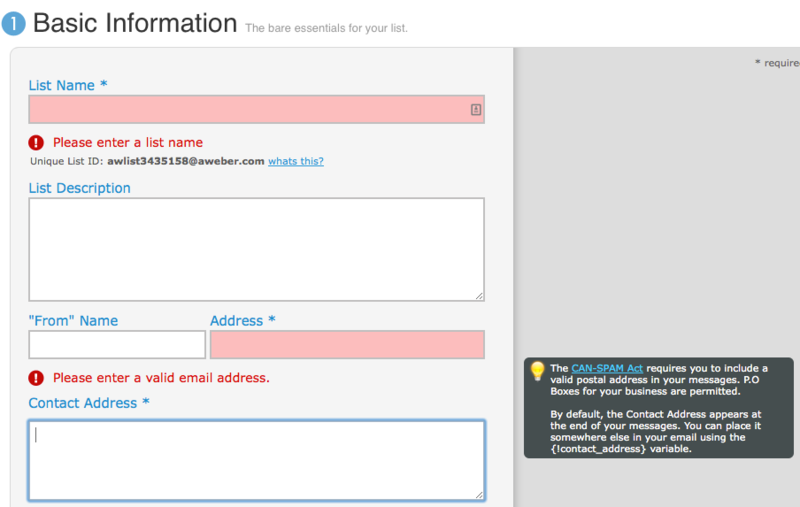 (Make sure you leave room within your image for the “Name” and “Email” fields as well as the subscribe button). Upload your graphic/image to your WordPress library. Choose a basic template in the Aweber form editor; delete all unnecessary fields. Click the “Image” button in the form editor and add your image URL in the space provided (which you can now get from the uploaded image in your WordPress media library) and hit enter. Adjust and fine-tune using the editor tools to get the layout/design just right. 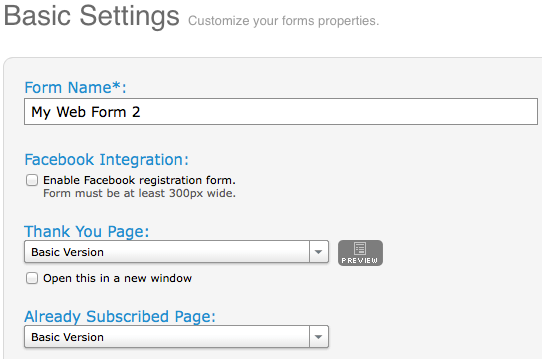 Give your form a name so that you will easily be able to identify and keep track of the forms you create. The “Thank You Page” is the page your new subscriber is sent to after they have entered their email address and clicked the subscribe button on your sign up form (at the same moment, the email confirmation is being sent to their inbox). In the drop down menu, you have several “Thank You Page” options created by Aweber to choose from. All of which let your subscriber know that a confirmation email has been sent and that they must confirm their consent by clicking on the link within that email. There is also the option of creating a “Custom Page” (much like the “Success Page” we previously created), that your new subscribers can be directed to, rather than Aweber’s pre-made options. If you decide to create your own custom thank you page, ensure you let people know that a confirmation email has been sent to their inbox, and that they must click on the link to confirm their interest and to receive more email updates from you. This is also another great opportunity to keep new subscribers on your site. Consider providing a link to info on your work and projects or links to articles and pages you wish for them to visit. Advanced Tip: On occasion, there will be people who have previously signed up to your list, but have either forgotten that they have done so (this is me! ), or they sign up for your offer again because it’s easier than searching their computers for the original download (yep, again me!). Aweber provides a basic “You are already subscribed!” page, but it’s essentially a dead end for a reader who is showing interest in what you have to offer. Instead, click the down arrow and choose Custom Page. Add the URL to the web page that holds the download link to your freebie or opt-in offer, so that your eager reader quickly gets access to what they want, plus they are back on your website to devour more of your great content. Once you’ve saved your settings, click the button that says “Go to Step 3”. 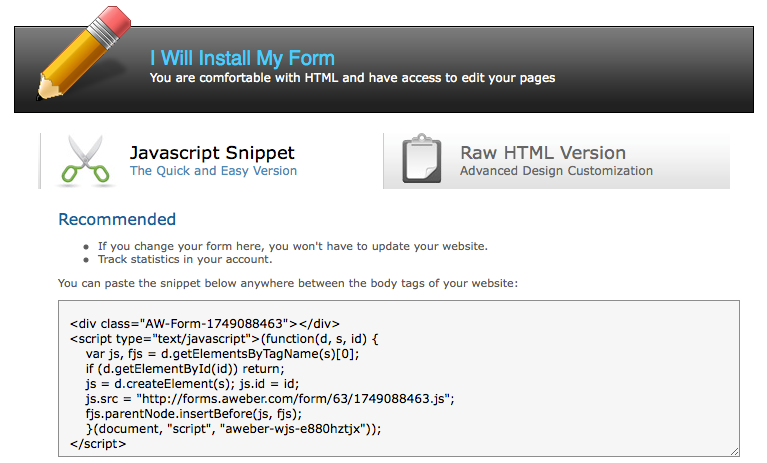 This is the step where you will get the code to make the form visible and functional on your site. It’s just a quick copy and paste; nothing complicated. I’ve Copied the Code, Now What? If you wish to add your new email opt-in form to your sidebar, go to your WordPress Dashboard and click on “Appearance”, then “Widgets”. Drag a new Text Widget to your sidebar where you want your form to appear, and paste the code you copied from Aweber. Save it, and then check to see how it looks on your site. If you’d like to add your form on a page or within a post, paste the copied code into the Text (or HTML) editor of the post or page where you want your form to appear. Your new sign up form is now up and running! The final step in your email set up process is to create your welcome email and any additional follow up emails that you wish for your new subscribers to receive. Just to be clear, your welcome email is pre-written and sent automatically and immediately to your new subscribers upon sign up (see diagram). It is in this email that you would add your link to the sign up incentive you promised, welcome your new subscriber, thank them (again) for joining your community, and let them know what they can expect from you going forward. It’s a good idea to set clear expectations on when–and how often–you will be sending emails, as well as what your new subscribers can expect in terms of the content you will share in your emails. What Exactly is an Autoresponder Series and Why Would I Want One? Your welcome email is really just the first email in a series of possible follow up emails, often referred to as an autoresponder series. This allows you to pre-write any number of emails and have them sent out, in order, at customizable time intervals–automatically and to every new subscriber. You can even ensure that your follow up emails (other than the Welcome Email), go out only on specific days of the week. To create your Welcome Email (and any additional follow up messages), hover over the Messages tab and click “Follow Up Series” from the drop down menu. Then click the green “Create a Follow Up” button. Design and write your Welcome Email, and when complete, make sure to save and send a test email to yourself to see if it is appearing as it should. Click “Next” to move to the “Settings” page, where you can choose how and when your message is sent. As above, follow up emails are pre-written and set up to automatically go out to subscribers in a set sequence and interval. Broadcast emails are not pre-written, and can be sent out in addition to your follow up series. They work well for more timely information, newsletters, recent news and upcoming events or book launch updates. The key is to coordinate your broadcast messages with your follow up series to strengthen the connection and engagement with your community, without overloading them with emails. You should now have your first, shiny new email list up and collecting email addresses! Congratulations! We are over half-way done the Email List Building Series, having uncovered why an email list is a must, how to create a compelling sign-up incentive, and now, the nuts and bolts of your email list set up and adding web forms to your site. The final two posts in the series will help you determine what to include in your emails to build your subscribers’ interest and engagement, as well as smart ways to continue to grow your list over time. If you know other writers who will benefit from this series, please share. And if you have anything holding you back from creating your own email list, let’s discuss it in the comments below. As I hinted in the beginning of the article, a random commenter will be chosen to receive a free “tool” to help boost their email list building! Mustafa Khundmiri at Plugmatter has offered to provide a complimentary copy of their premium Optin Feature Box plugin to one lucky YWP reader. Yippee! Please note: Some affiliate links are included above. I will earn a small commission if you buy from one of my links, at no extra cost to you. This helps Your Writer Platform continue to provide loads of free, quality content. I appreciate your support! I’m a slow learner, so I will have to reread parts 1 & 2 before I get into part 3. Doing a quick review, you have put a lot of the intrinsic aspects into understandable language that even an old fart like me can comprehend. Let me know if you have any questions after reading through parts 1 & 2. Kim, I could really use the Optin Plugin, as right now I’m using a free version of another plugin and have had a few problems. Do I remember incorrectly, or did you say something at the start of this series about offering your own plugin that you created for writers? I was looking forward to that, but maybe I misunderstood. I am not on Aweber at this time, so I can’t use the instructions from today’s post. But I appreciate the work that went into writing it up. No, Connie, I haven’t created a plugin of my own, but I have recommended a few to make things easier when it comes to building your list. Although the specific instructions won’t help, the overall process is similar with most email marketing services. What are you currently using to collect email addresses now? Sorry for the late reply. I am using a free version of ITRO. It’s not the best, but it usually works. I am waiting until I start making money on my book (or just before it is published) to pay for a plugin. I use MailChimp for my list. I’m still working on my first 1000 subscribers. I’d put off adding an image to my email sign up form, but your article reminded me to do it. Thanks for the link to pikmonkey. It helped me make a good graphic into a great image. PicMonkey rocks, and I’m glad you were able to easily customize your sign up form. Wow, yet another stellar post about building an email list. I’ve used Aweber for a long time, but I learned even more about it from your post. For example, I didn’t know I could create a Custom Page for someone who has already subscribed. That’s a really valuable thing to know – it’s another opportunity to engage with my readers! Thanks again for another uber-educational post, Kim! You are more than welcome, Bobbi! And yes, that one little tweak of creating a more positive experience for a reader who has already subscribed (and clearly would have been happy to again! ), is golden. This also works really well if you decide to provide multiple freebie offers, but still only want one main list of subscribers. Very informative and timely information for me. I will try to follow your advice to the letter. Hope it works well for you, Jeanne! Awsome support here Kimberley – and tell me – what programme do you use to create that blackboard flowchart? Thanks, Paul! And I use Keynote – I’m on a Mac. People definitely have strong opinions about popups, but they do tend to get results. Here’s how I look at it: popups can often help you build your list faster, but they aren’t a deal breaker when it comes to building your list. You can certainly build a solid list of subscribers without ever using a popup. It is worth considering, however, whether your audience feels the same as you, or looking into less intrusive reminders like the “exit intent” style popups or a feature box. Actually the exit popups don’t bother me at much because I’ve had time to see the site, know I enjoy the content, etc. I think that’s what bugs me with the entry one, when they ask me to signup before I even know if they have a site I like. Oh geez, and I’ve been to site that have a popup for every new page you visit. That’s too pushy. I’m a sucky marketer. I do have a image/link for my list in my sidebar. No form, as I use yahoogroups for my list. Agreed. Some sites are just over the top aggressive, and you have to wonder who it is they are trying to attract! How does yahoo groups work for list building? YahooGroups is good for newbies (like me) that have few mailings or aren’t sure what to put in the mailer but want to start building a list. If need be in the future, AWeber and Mailchimp and all the others accept an export of the yahoo mailing list. There are a few best selling authors (like Jim Butcher) that use yahoo groups and have over 10,000 subscribers. So, I think it must be pretty good. The one thing I would caution you about with using a service like YahooGroups, is that you really have no control over the list you are developing. I’ve discussed this in Part 1 of the series, but a powerful business asset like your email list should not be built on “rented land”. It’s funny I recently did a post about all the features newsletter services have. It’s overwhelming when you start looking. True, but most of the popular ones seem to have similar basic features. What I like best about email marketing services is that the nit-picky stuff is automated, and the legal requirements of email marketing and networking are built in (like automatically including your mailing address at the bottom of each email). You can also see how people are responding to each of your emails, which is helpful for planning future email content. 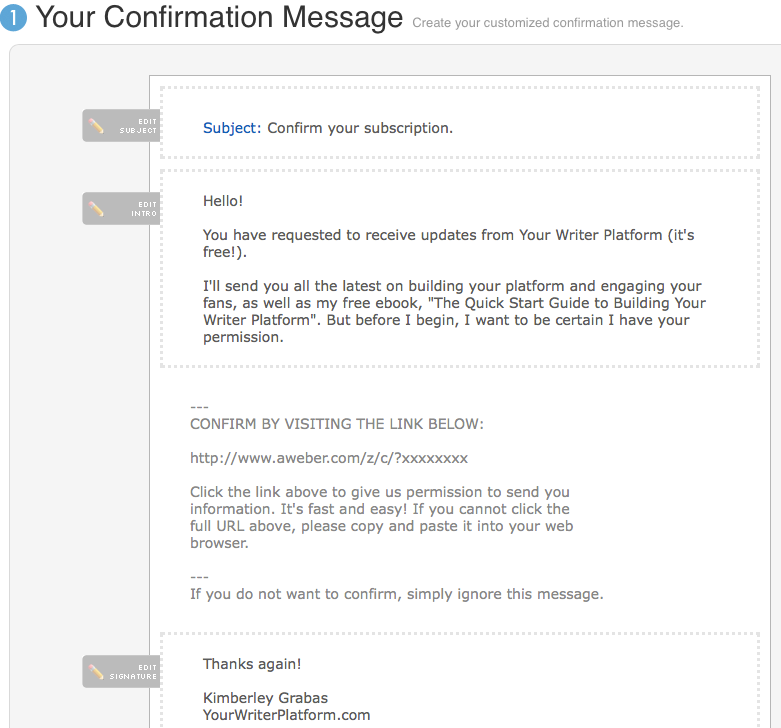 Aweber is awesome, and Mailchimp is another good resource for writers. Have a look through their features and see if one might be a good fit for you. Hey Kimberley – very nice series going! Especially liked the tip about using Java Script rather than straight HTML for the automatic updates! Thanks for stopping by, Michael! I just figured that one out recently, and it works great for my sidebar opt-in form. But I have had difficulty making it work within a post/page, so I use the HTML or the Optin Skin plugin. Kimberley, what a great series, and like you I have waited far too long to get this started. But there’s no time like the present to jump right in! I’m assuming that if I use another mail service other than AWeber, many of the steps will be duplicative or seem similar. I’m looking at MailChimp as my choice. You’ve provided so many tips, links,and free info here that I am overwhelmed at the moment, but I absorb quickly and am good at using technical directions so it should go well. I’ll let you know! MailChimp is also a good choice, Sherrey. I don’t use it, so I can’t provide a walk through, but I would imagine the process would be very similar. This email list building series of articles has been SO valuable Kimberley! I can’t thank you enough for the inspiration combined with the actual, specific, how-to steps. Rock and roll! Glad to hear that you’re finding it useful, Michael! Pop ups always cause a bit of a debate, but it’s hard to argue with the numbers. I love the exit intent pop ups, because they give people enough time to have a look at your content, and then a gentle nudge just before they leave your site. You can also set them to pop up only every so many days, too. That way your regular readers won’t be interrupted on every visit. Authors with Platforms Sell Books. 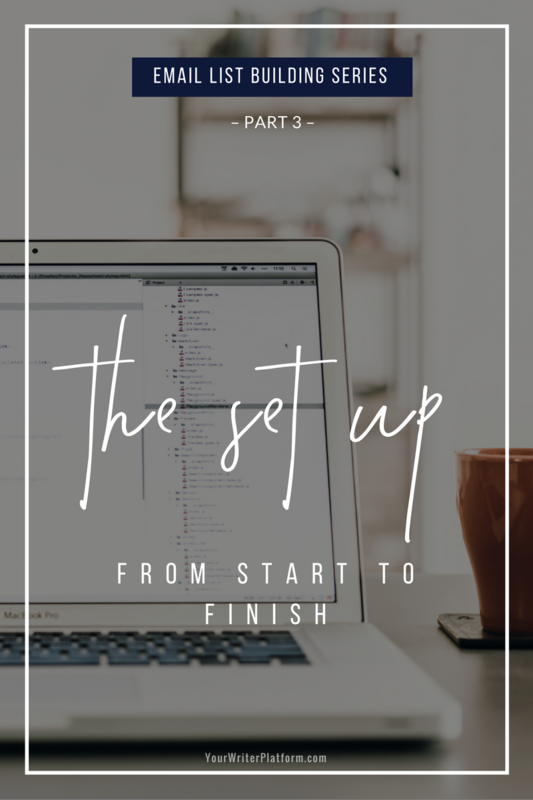 Get on the Insiders List to receive the free Quick Start Guide to Building Your Writer Platform, exclusive content via email, and instant access to a growing library of downloadable resources. 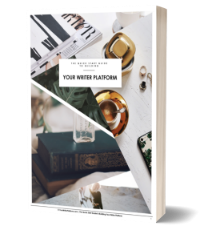 Get your free "Quick Start Guide to Building Your Writer Platform", plus regular email updates delivered straight to your inbox!